December 17, 2012  "Never before have we seen our babies slaughtered," Sen. Joe Manchin, D-W.Va., said today on MSNBC. "This has changed the dialogue and it should move beyond dialogue. We need action," he added. Manchin is a member of the National Rifle Association and a hunter. 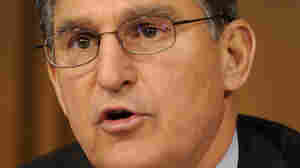 March 8, 2011  Sen. Joe Manchin, a West Virginia Democrat, criticized both President Obama and congressional Republicans, as he claimed moral high ground for himself in the spending cut fight. It was his attempt to triangulate since he represents a state with both Democratic and Republican leanings.